This look can take you from the stage to the intimate range of the small nightclub. Sleek black with silver beaded fringe means you have found quality for either a costume base or a simple outfit to be worn alone. You will love the versatility. 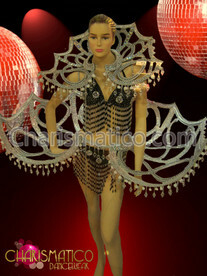 This listing consists Beaded Belly Dance Bra and thong customized into your measurement.